In my Olympics lesson plan you will be truly amazed to what lengths people will go to to win. If you thought you were fairly clued up on the different ways it's possible to cheat the system, you will be astonished at the variety of creative ways people have explored to grab that elusive gold medal. 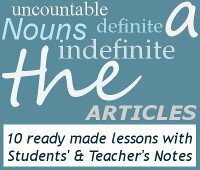 This lesson is based on an article from The Independent newspaper, and gives examples of nine different occasions during the Olympic Games over the last century, where people were caught 'bending' the rules. This Olympics lesson plan is suitable for upper-intermediate and advanced level English (B2, C1 and C2). This Olympics lesson plan starts off with some introductory discussion, where the students get to use their imagination (or memory, as the case may be), to come up with as many possible ideas on ways to cheat in sport. This is followed by a fascinating article which looks at nine different athletes over the last century of the Olympics, and different ways that they cheated. This reading practice can be done as an information share. The students also get to ask each other questions to find out if they can work out what skulduggery was going on, so they have the opportunity to practice direct, indirect and question-tag questions. This is followed by some new vocabulary, as well as idioms relating to the world of sport. The students have to guess which sport each idiom originated from, and then match it to it's definition. The lesson finishes off with a fun game of pictionary.